Lorenzo followed teammate Andrea Dovizioso home in a Ducati 1-2 at Brno, and the pair are the early favourites for victory this weekend as the Red Bull Ring venue favours the Desmosedici bike. But Marquez's consistent form has left Dovizioso and Lorenzo 68 and 76 points adrift of the Honda rider respectively, and Lorenzo is not convinced Ducati can make enough of a step to overcome such a deficit in the nine remaining races. “We need to still two or three tenths of speed to be able to win four or five races in a row and recover so many points to Marc,” Lorenzo said. “For the moment still this is impossible, because the power is more or less equal for more or less all the brands, so for this it’s difficult. “Marc is competitive at all the tracks, he don’t crash so much at this moment. Dovizioso agreed that recovering the points to Marquez was “very, very difficult”, and stressed Ducati needed to find more performance before he could think about the championship. He added: “Until we are really good in every area, it's really difficult to recover a lot of points to Marc. Marc in a bad situation is [still] on the podium, so it's difficult. Ducati has won both Austrian Grands Prix since the Spielberg-based venue's return to the calendar in 2016, the marque benefitting from its power-sensitive layout. 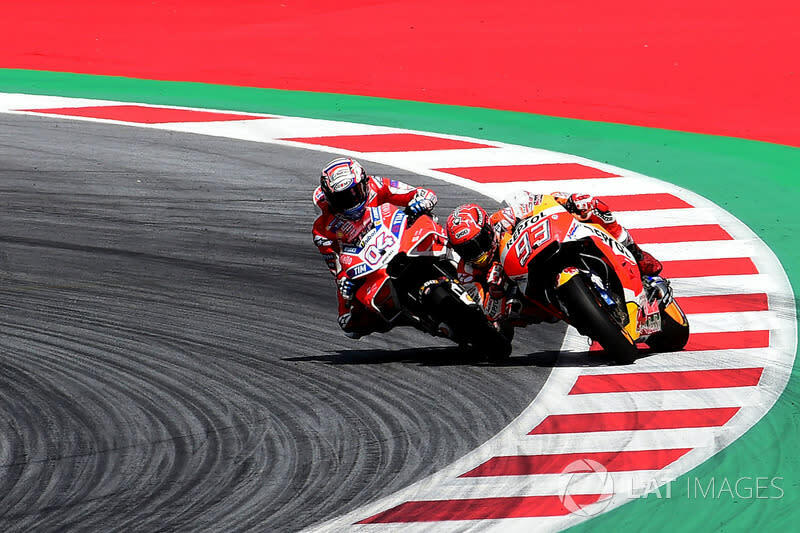 However, last year the battle for victory between Dovizioso and Marquez went down to the wire, and the former is convinced this weekend will not yield an easy win for Ducati. “I expect this year the competitors are a bit stronger because everybody increase the power, the winglets, so maybe they will be closer,” he said. Danilo Petrucci, who rides a 2018-spec Ducati for satellite team Pramac, offered a similar assessment. “It's not one of my favourite tracks - I have to enjoy the thing that Ducati here have been always fast, but I don't think we have any more the advantage we had for example in 2016,” he said. “The other manufacturers close the gap with the engine so we don't see always Ducati fastest with a lot of kilometres gap. We are there, more or less."